* Mariell's wholesale rhinestone and pearl daisy cluster bridal Bracelet is a stunning way to accessorize your wedding gown. * With dazzling crystal rhinestones set in gold and delicate ivory pearls, this is a modern rhinestone bridal look at a fabulous low wholesale price. 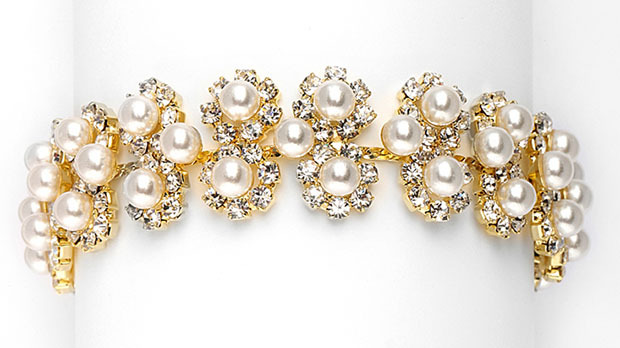 * Accessorize your wedding gown with Mariell's gorgeous 7" long x 3/4" w pearl bracelet set in sparkling gold rhinestones. * It is sure to be a customer favorite! * We offer a gorgeous matching necklace (3805S-I-G) sold separately.